Surrounded by the azure waters of the Indian Ocean, 1000 miles east of the African mainland, the Seychelles islands are a true paradise. I had often heard people raving about the beauty and clarity of the Indian Ocean, and now I understand – it really is extraordinary. There are 115 islands in total; the largest are made of granite and are the oldest midoceanic granite islands in the world, all that remain of an ancient continent. As a result, their scenery is unique and spectacular, with a number of rare plants and birds. Another striking thing about the Seychelles is how welcoming and friendly the locals are. The predominant culture is Creole – most of the population is of African descent, whose ancestors were brought here by French and British colonists. The locals speak Creole among themselves, though English and French is also widely spoken and understood. Seychellois have a lot of pride in their islands, and are devoted to protecting the ecological diversity. Many visitors come to the Seychelles as a stop on the way home from an African safari. It’s the ideal place to unwind for a few days, and that’s just what Terry and I did – our one major activity was a boat trip to a neighboring island. 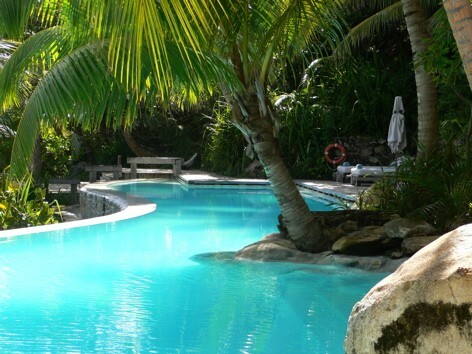 We stayed on the pristine North Island, which is open only to guests staying at the island’s small lodge. Exclusive and private, North Island is popular with couples and celebrities (Salma Hayek stayed in our villa just before we did). The Seychelles are also great for families, with hundreds of gorgeous beaches to enjoy, along with bird-watching, snorkeling, scuba diving, and water sports.